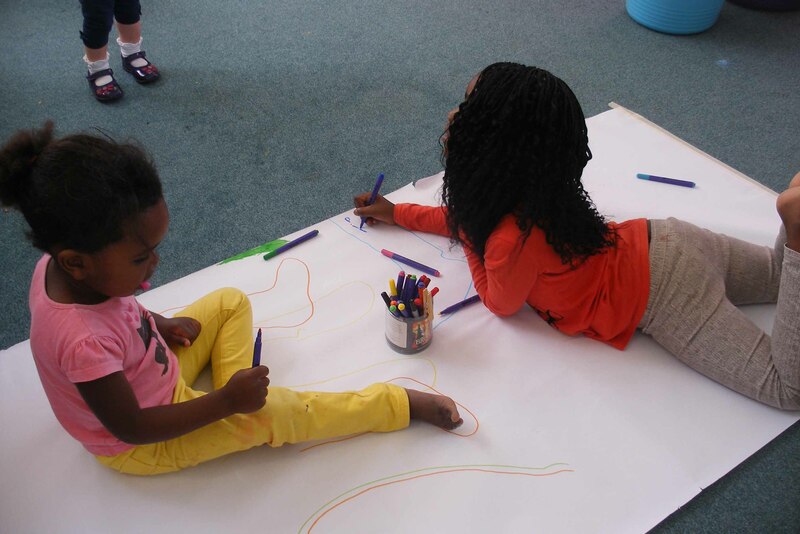 Playbods artists Kim Glassby and Bryony Pritchard have been working with Leeds Libraries during the summer and early autumn to lift children’s stories from the page through movement, dance and visual arts. Ages of participants ranged from three-weeks-old to eighty! We began with shared interests in moving, dancing, playing, making, building. Both of us very happy that we had found someone to play with, we found a small studio space and brought some items from our play boxes: Large and small pieces of fabric, cardboard boxes, pegs, brollies, fans, hula hoops… Without planning or speaking we started to play - hanging things from fixtures and fittings, creating dens and landscapes, climbing-in, getting wrapped-up, and finding dances. After lots of playing and working with some texts which gave us inspiration for movement & playful games such as: The Game of Let’s Go and Doodle Cook by Herve Tullet and The Beautiful Oops by Barney Saltzberg, we got on to the subject of storytelling and how so many stories emerge as we play and move. We wanted to discover if we could make stronger links between active play and storytelling, and invite members of the public to work with us. We needed an inviting venue and a captive crowd. We thought about the exciting prospect of sharing our ideas for playful storytelling inside it’s natural habitat of the library. We approached Leeds Libraries with our ideas and after a few meetings, they said yes! Leeds Libraries offered us residency days within different libraries of the city – Horsforth, Armley, Garforth and the Childrens’ Mobile Library. 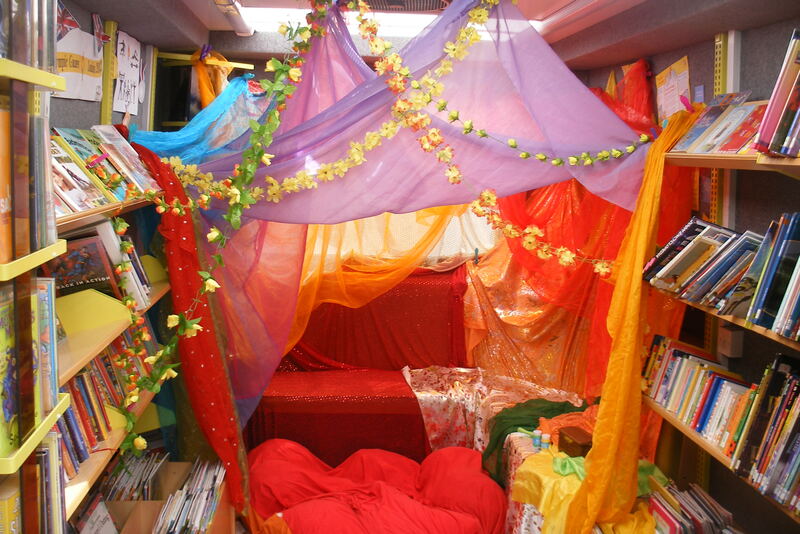 Within the children’s areas of the libraries we created comfy reading dens and colourful spaces in which to play and explore. We then invited young children and their families to play with us and use the comfy spaces for lounging and reading, at a drop-in basis, where they could join-in with as much or as little as they liked. Some of the library staff were surprised to hear that we had starting points yet no middles or endings, and that we wanted to leave things open for the families to decide. All staff were very trusting to let things happen and adapt their usual spaces. The staff observed as things unfolded, many also taking pleasure at joining in with us. Fitting with the seasonal (July!) rain storms, brollies of different colours and sizes unexpectedly became a core feature of our play environment. These provided a perfect backdrop from which to hang sensory items such as feathers, and shiny paper. The younger children enjoyed crawling and dancing underneath the brollies and the older children were keen to be challenged by the games and questions which we hid inside. With the simple resources as a starting point and the opportunity to immerse their whole selves in the materials and create their own landscapes, the children and parents created new fantastical worlds, characters and stories. Their stories took us to all sorts of places - from the deep dark depths of the freezing Ocean, to flying on a witch’s broomstick towards a frogs’ birthday ball. We also took our ideas to paper on the floor and enjoyed marking journeys and pathways in and around one another, with our bodies and coloured pencils. The whole floor became a storyscape. One little boy, aged 2 sang his lines as he drew, and we joyfully joined in with him. One child, aged seven, said that he could not read but by the end of the session he realised that he had a gift for storytelling. During one session we were inspired by the story of Mrs Armitage on Wheels by Quentin Blake. We deviated from the page with the participants and re-created her chaotic bicycle journey with hula hoops, buckets, bubbles, bells and fabric. 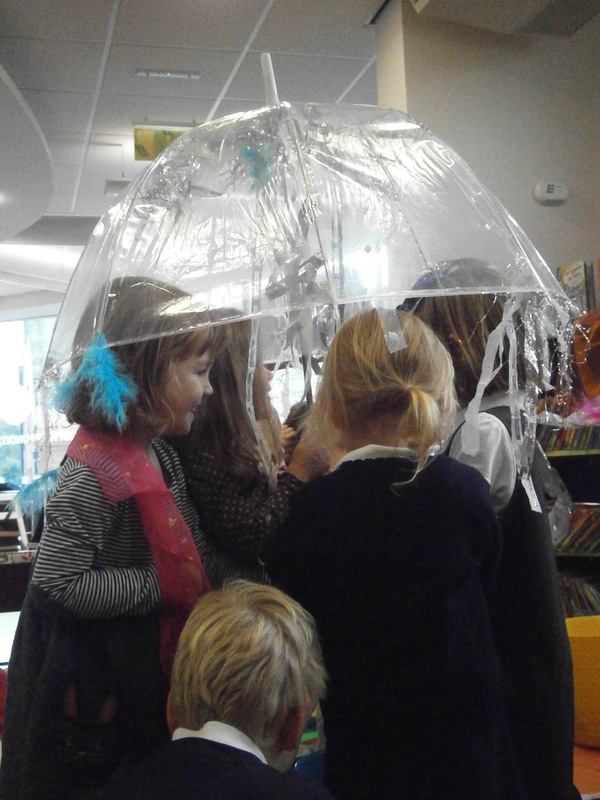 And then families designed their own fantastical travel sculptures and went on adventures around the library. We were fascinated to notice that the creative play didn’t distract from the desire for the children to read books; in-between and after the play many children would choose a book or two from the shelf and take to the cosy reading den. 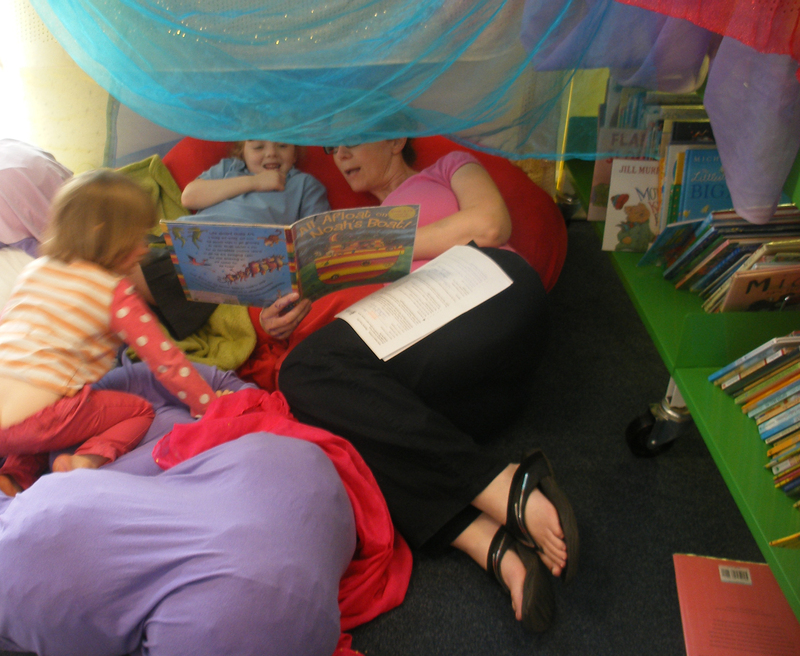 Some parents needed some encouragement to climb into the reading den, but once there they cherished shared reading time with their children. We are now in the process of creating a book which will celebrate the stories and games created by the participants of the project. This will be exhibited across Leeds Libraries from November, and will undoubtedly feature a brolly or two! We would like to thank all of the staff at Leeds Libraries who were involved in the project, with special thanks to Bronwyn Brady – Area Development Librarian for West Leeds, the Schools Library Service and Leeds Inspired for supporting our project to come to life.